The Super Scope continued the apparent requirement of pre-disc based systems to have a gun peripheral. Thanks to Dave Di Giorgio and JB for some of the information here, and François Gingras for the pictures. I have to admit that I have never owned or used a Super Scope. Nintendo decided against making a pistol-style gun like they had with the Zapper, opting for a more bazooka-style design. It was rather cumbersome and only lightly supported through the lifespan of the Super NES. I remember seeing a bunch of copies of Battle Clash in the bargain bins of stores in 1996. Kind of pointless to get it without the gun. In response to the Super Scope, Sega ended up releasing their own poorly received Menacer peripheral, taking design cues from the Super Scope. The Super Scope came out fairly early in the lifespan of the Super NES in the US, in early 1992. In Japan, it came out much later. 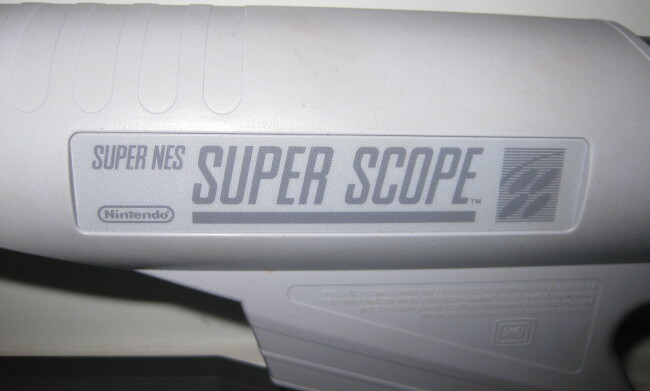 According to Nintendo's website on the Super Scope 6 (which amazingly is still up), it came out on June 21, 1993, over a year after it came out in the US. The PAL release also came in 1993, apparently around the same time as in Japan. In one of the first nods to wireless capabilities for a video game device, the Super Scope was not directly connected to the SNES. 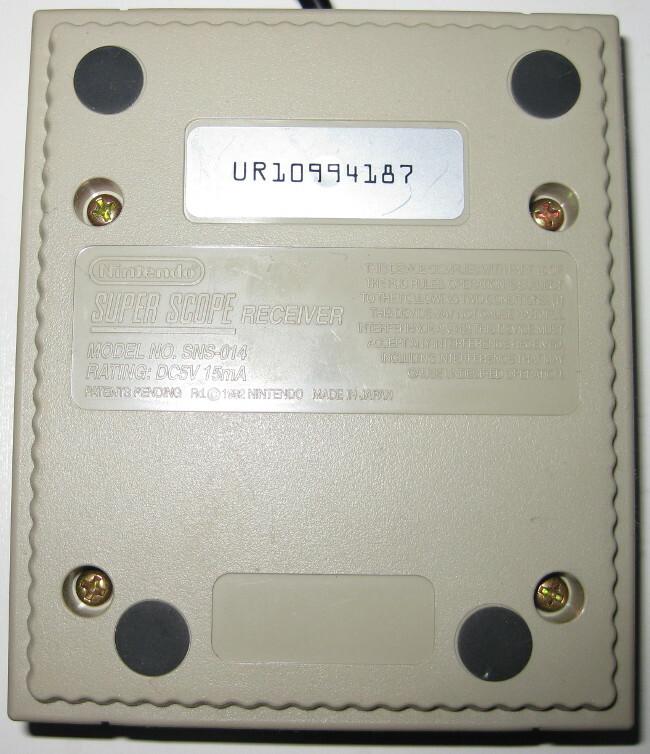 Instead, a sensor that plugged into the second controller port, which served as the "receiver". The huge negative of this is that the Super Scope needed six batteries. Also, from videos I have seen, the accuracy of the Super Scope was highly dependent on the TV you used. All in all, it is not something that is considered to be an essential part of the Super NES library. The best description of the technical details on how the Super Scope works is from the official SNES Development Manual. The function of the scope is entirely dependent on the timing of refreshing of phosphor (i.e. pixel) rows on a cathode ray tube (CRT) screen (the screen on a CRT refreshes one line at a time). When the Super Scope is triggered, it sends an infrared beam towards the TV, and it analyzes the screen for a few frames to determine where the Super Scope is aimed. Since the Super NES also renders line-by-line, it can determine where on the screen the Super Scope is aimed based on the refreshing of the phosphors. An inherent limitation of how the Super Scope works is that it is sensitive to how rapidly the phosphors decay, so the colour red could not be used in games with the Super Scope. This is because red phosphors do not decay quickly enough to work with the scan when the Super Scope is triggered. 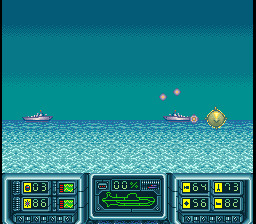 As a result, Super Scope games tend to have very washed out graphics. Since the Super Scope's function is completely dependent on how CRT screens behave, it will not work on non-CRT TVs. This means you cannot use the Super Scope on modern TVs. 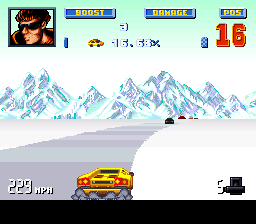 The ideal distance from the TV to play the Super Scope is about 3 meters from the screen. If the Super Scope is too close to the screen, there can be errors since it incorrectly detects the refresh rate of the phosphors. Here is a summary of the games, in somewhat chronological order. Super Scope 6 came with the Super Scope. 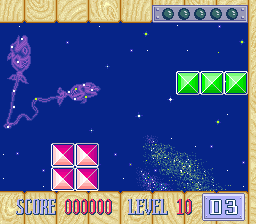 It essentially is six mini-games. If you look at promotional material and even Nintendo's official SNES games listing, they often give the title of this game Blastris/Lazerblazer. Blastris has two block-style puzzle modes. The first, "A" is basically a Tetris-style game, except the blocks go from left to right. Each time a piece falls (or shuffles? ), you get two shots to remove block parts. 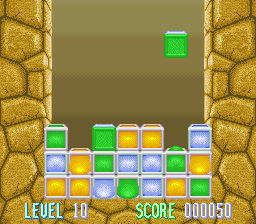 "B" is more like a Puyo Puyo puzzle game, where you have to match several adjacent coloured blocks. The third game is not even a puzzle game. It is basically just "whack-a-mole". I couldn't get this to run very well in the emulator I was using (bsnes-plus), so I can't comment on how good these are. The second set of games is Lazerblazer. They are basically just variants of the same thing - shoot planes, missiles, etc. Graphically, nothing to write home about. Calling it "six games in one" would be overselling it. The game was released in Japan on June 21, 1993. 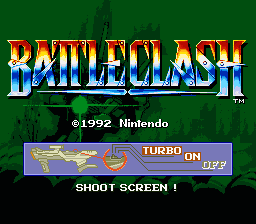 BattleClash was one of the games that Nintendo really used to push the system. It was given a dedicated commercial that I remember well. After seeing this commercial, you can see why Sega decided they had to put out their own gun peripheral. The game itself, if played with a mouse on an emulator, is pretty easy. You simply have to shoot the projectiles as the come, then charge your weapon for a few seconds in order to do maximum damage. I could see that being more problematic with the actual Super Scope. 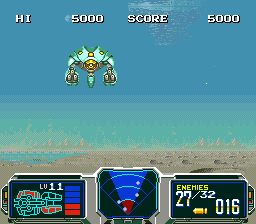 It is rather plain for a light gun game, with just one enemy mech per level. 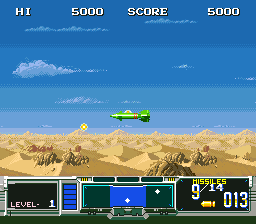 The game was released on June 21, 1993 in Japan as Space Bazooka, same day as the Super Scope itself. 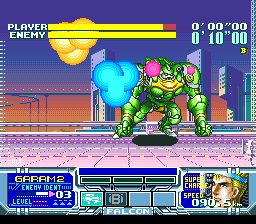 Bazooka Blitzkrieg would have come out at a similar time to BattleClash, likely towards the end of 1992. It was the first dedicated third party Super Scope game, published by Bandai. 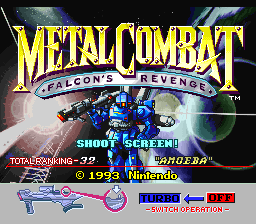 This game is more like a standard arcade rail shooter, with the screen slowly scrolling towards the right. The game utilizes the turbo mode, so you can just keep shooting continuously. The game came out in Japan on August 27, 1993 under the title "Destructive". This game did not come out in PAL regions. 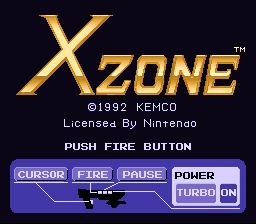 X-Zone was another third party Super Scope game that likely came out in late 1992, by publisher Kemco. 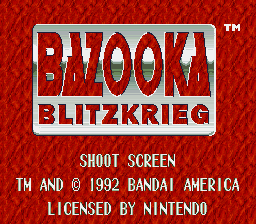 The game plays more or less like Bazooka Blitzkrieg, with the screen slowly scrolling to the right (aside from the first stage which has the player descending towards a base in mode-7, but effectively the gameplay is the same). The game can be played without the turbo mode on, but it would probably make it impossible. The PAL version of this game is notable for its rarity, only having releases in Australia and Scandinavia (the later being a rental only title). The game came out in Japan on August 27, 1993. 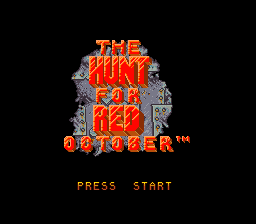 The Hunt For Red October likely came out in early 1993, published by Hi Tech Expressions. 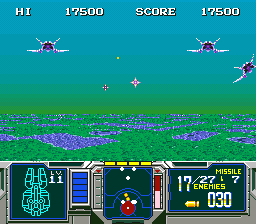 The majority of the game was actually a side-view shooting game (like Gradius), but you could find bonus levels where the Super Scope could be used. The shooting action is not nearly as good as the dedicated Super Scope games, and the main game itself is not great to begin with. The game came out in Japan on October 1, 1993. 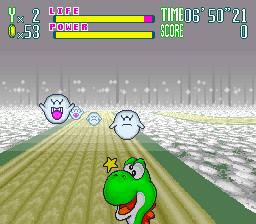 Yoshi's Safari came out in the first half of 1993, making it part of the second generation of Super Scope titles. 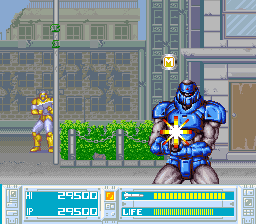 The game makes heavy use of Mode 7, and is one of the most impressive of the Super Scope games. The cut-scene graphics and the sound in this game are pretty second rate compared to normal Nintendo standards. The game is made easiest if you put on turbo mode, and just keep tapping the shoot button. Probably the most challenging part is that you have to jump over large gaps in certain parts, and the timing is not easy. You also have to be careful not to shoot Yoshi, because he can take damage! Definitely up there with the best that the Super Scope has to offer, though. 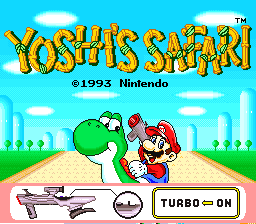 Yoshi's Safari was released in Japan on July 14, 1993. 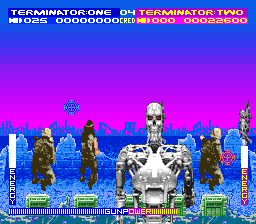 T2: The Arcade Game was a port of the arcade game Terminator 2: Judgment Day, renamed due to the fact that there was a platform action game with that name on the SNES. 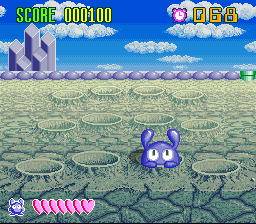 The game also was compatible with the SNES Mouse, which is probably a better choice for playing this game. The game looks good and in fact might very will be the best looking of the Super Scope releases. Probably the reason for this is that the graphics are purposely dulled in order for the Super Scope to actually work - it is a naturally dark hued game. It plays very much like any arcade shooting game, though it has the annoying feature that you eventually can run low on ammo. The game was re-released in 1998 by Majesco. The game came out in Japan on February 25, 1994, making it the last compatible game to be released in that region. 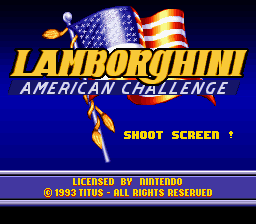 Lamborghini: American Challenge was a game in the same vein as Top Gear. It was released in late 1993 by Titus. If the Super Scope is connected, you can activate a mode that allows you to play the game using it, providing a very unique gameplay experience. Turn on the turbo mode, and hold the fire button to accelerate. You are basically constantly shooting, so you must take out the other cars. If you take too much damage, you get stuck in first gear. I don't think this mode was fully tested, as at one point the game kept playing after I crossed the finish line (though the stage ended when I let go of the fire button). A unique mode, but not really essential to the main game. 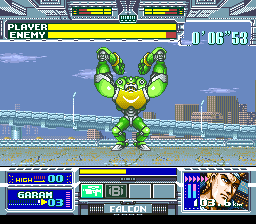 The game came out in PAL regions, but was published by Mindscape. It's essentially a very, very simplistic save RAM mapper. It helps build OAM (sprite) tables in RAM (without the need for bit manipulation), that are then DMA'ed into OAM memory. 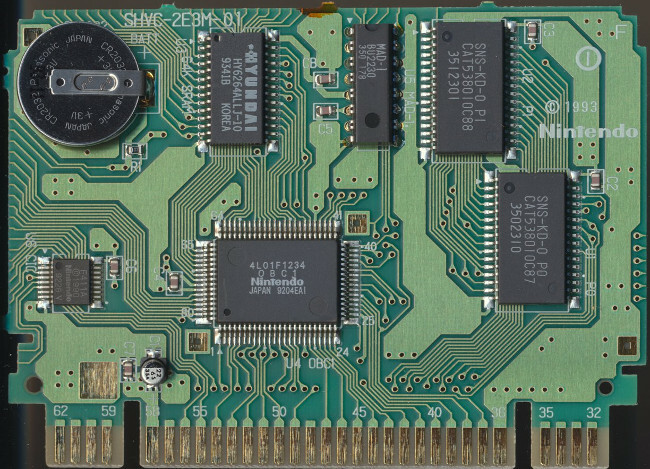 The OBC-1 chip was manufactured in early 1992 (the fourth week in the above PCB). This is long before Metal Combat was released (in the above PCB, the manufacturing dates are the last two weeks of 1993). I have no idea why there is such a discrepancy. The only theory I have is that this chip was originally made for the first Super Scope 6 game or maybe even BattleClash, but they decided to not go with it for them. At any rate, Nintendo was sitting on these chips for quite a while. 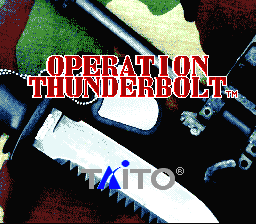 Operation Thunderbolt is a port of the 1988 arcade game by Taito. It is also compatible with the SNES mouse. This, along with Tin Star, were amongst the last Super Scope games, coming out in late 1994. The game shares the code name with a military operation by the Israeli Defence Forces in 1976 to rescue hostages in Uganda, known as Operation Entebbe. 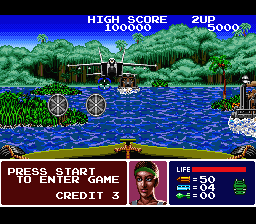 Given that the game is about rescuing hostages in a fictitious African country, it seems likely that the game was inspired by this namesake. The graphics are decent enough, but there is no music. There are six characters to choose from, and the style of guns differs for each one. I would say this game is a better effort than the earlier Super Scope games, but not as good as T2 or Metal Combat, primarily because there are just too many enemies and projectiles to deal with all at once (at least they give you a pretty generous health bar). This game is a US exclusive. 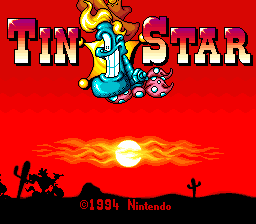 Tin Star was the last Nintendo published Super Scope game (and possibly the last Super Scope title), coming out in late 1994. 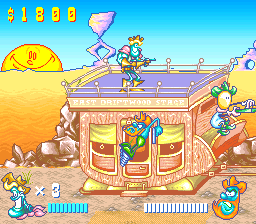 The graphics are amongst the best in the SNES, featuring cartoony drawings, with a wild-west/robot theme. 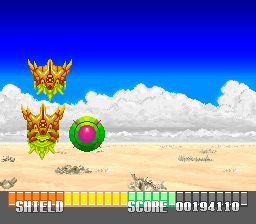 I found that the powerups and enemies tended to move almost too fast to hit them with any accuracy, so it is definitely a challenge. 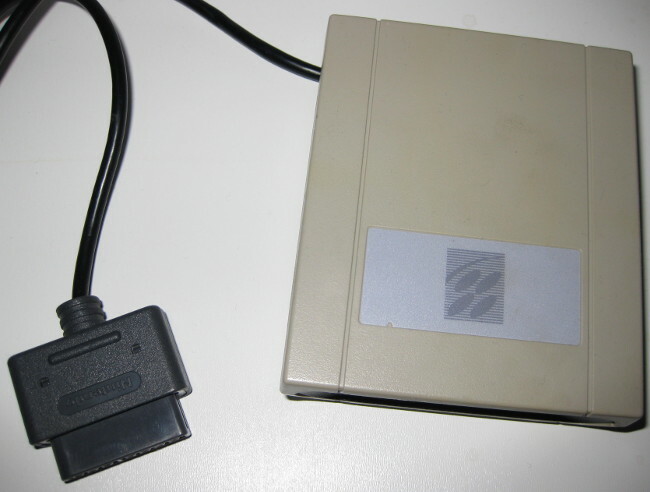 The game can also be used with the SNES mouse. 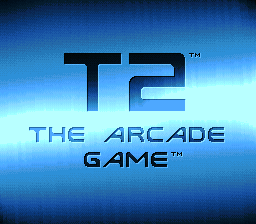 On the box, it even claims it is the first game to use both peripherals, but T2: The Arcade Game almost certainly came out first. This game was only released in the US. If you use the Super Scope in this game, you can shoot the Lemmings and kill them. 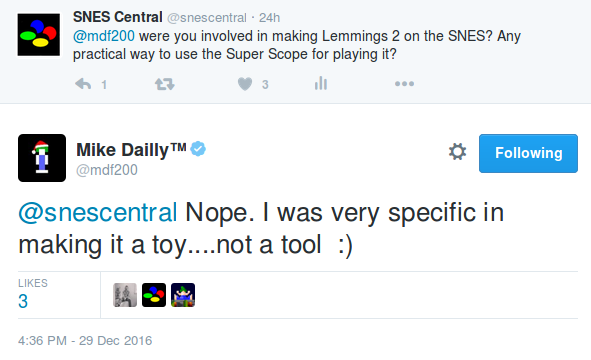 There is not much else to it, the game isn't actually playable with the Super Scope. But finally, you can get those dastardly Lemmings. The game came out in late 1994, making it the true final game that "uses" the Super Scope. The Super Scope was the last time a video game company really pushed a gun accessory as an essential component of the system. Though subsequent consoles had gun accessories, they generally were geared towards individual games and not as heavily marketed (such as Virtua Cop on the Saturn, and Point Blank on the PS1). Nintendo itself didn't really go back into the light gun genre until the Wii, with the release of the Wii Zapper and Link's Crossbow Training.